Jeff Rose over at GoodFinancialCents.com recently had an epiphany when talking to a college class about investing and retirement. He realized that today's generations really aren't thinking about retirement, and a lot of them don't even know what a Roth IRA is, what a 401k is and just how to get started investing. He wanted to get people started thinking about retirement, and came up with the idea to start the Roth IRA Movement, a movement of bloggers and personal finance journalists to get people thinking about the basics of saving for retirement, specifically with the Roth IRA – one of his favorite retirement vehicles (and mine). Today 125+ bloggers are banding together in a one day event that will hopefully spur others to start thinking about retirement and saving for their future – in the Roth IRA or whatever retirement account best fits their situation. For my part in the event today I'm writing up a brief synopsis of the basics of the Roth IRA. 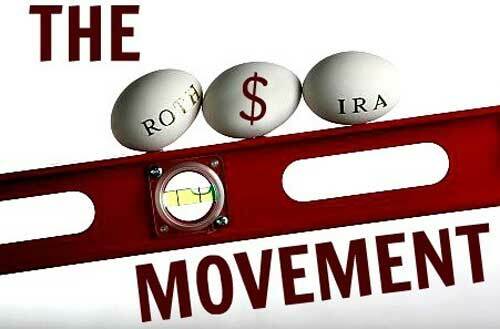 In 1997 the Roth IRA account came into existence when the Taxpayer Relief Act of 1997 was passed. The late Senator William Roth of Delaware was the main sponsor of the bill, and the account type bears his name to this day. The Roth IRA (Individual Retirement Arrangement) is a retirement vehicle in which you can invest in securities, stocks or mutual funds (although other investments, including derivatives, notes, certificates of deposit, and real estate are possible as well). Part of the reason the Roth IRA has become so popular in the past 15 years is because they offer a nice way to save for retirement that offers tax-free withdrawals at retirement. In other words, you are investing with money that has already been taxed, and when you pull the money out at retirement the contributions and earnings are tax free. Pretty nice, huh? The IRA is similar to the Roth IRA, but instead of contributing post-tax, you're contributing pre-tax and will have to pay taxes on the money withdrawn at retirement. The Roth IRA account type has contribution limits associated with the account. So unfortunately that means you won't be able to just dump as much money as you want in there every year. They've given the account special tax free status on earnings, but along with that come contribution limits. The limits haven't changed for the past few years. Since 2008 the contribution limits have remained at $5,000. For those age 50 and above you can make an extra contribution of $1,000 every year, which means you can contribute a total of $6,000. Here's a table showing the contribution limits for the Roth IRA since 2002. The income phaseout limits for contributing to a Roth IRA start getting phased out at about $110,000 for single filers, and at $173,000 for married filing joint filers on a Roth IRA. So basically when you reach the bottom level of the income phaseout limits, your ability to contribute to a Roth IRA starts getting phased out. To figure out how much you can contribute, you would subtract your modified adjusted gross income (MAGI) from the upper end of the phaseout range, divide by the amount of the spread in the range. You'll get a percentage after you divide. That percentage is the amount of the full $5,000 that you can contribute. So if you're resulting number is 66% – you can contribute 66% of $5000 – or $3300. Example: If you are married filing joint and you make $180,000, you would take $183,000-$180,000=$3000. $3000/$10,000=.30. $5000*30%= $1500. Want a more detailed explanation of figuring out how much you can contribute? Check out this post on Roth IRA Eligibility. Anyone with earned income along with a W-2 or 1099 can contribute to a Roth IRA. There aren't any age restrictions for contributing to a Roth IRA, so as soon as your child has earned income (that modeling job they got paid for may count) they can invest in a Roth IRA. The earlier they get started, the better their gains will be! Where to open the account (bank, discount brokerage or full service mutual fund company): I would personally open an account at a low cost mutual fund company like Vanguard, or if you want to be even more hands off, via an account with a company like Betterment.com. How you'll be adding money to your account: You'll need to figure out how you'll be funding the investments – if you'll be depositing $5000 for the year all at once, of if you'll be making regular deposits throughout the year. What types of things you'll invest in: Depending on where you invest you may have different mutual fund and stock options. For example, if you open a Roth IRA with Betterment you'll be limited to a pre-selected set of ETF index funds. With Vanguard or Fidelity you'll have a wider range of options. You'll want to do your research to figure out what's best of your situation. The Roth IRA is a great investment account option that most people should consider. It allows for tax free withdrawals at retirement, high income thresholds, and no age requirements so even your kids can contribute once they have an earned income. Why wouldn't you consider opening one? I know I already have! Previous Post: How Would You Handle A Financial Setback?